Uttarakhand and Himachal Pradesh, two hill states in the Himalayan range, are so far the worst hit by the extreme rains that struck northern India in the wake of monsoons that set in early this year. Media reports say nearly 60 persons have died in Uttarakhand, and an estimated 60,000 pilgrims are stranded. Heavy rainfall has wreaked havoc on the region because of the fragile nature of the Himalayan range and poor soil stability in its steep slopes. But it is man-made factors that have compounded the scale of the disaster. Unabated expansion of hydro-power projects and construction of roads to accommodate ever-increasing tourism, especially religious tourism, are also major causes for the unprecedented scale of devastation, say experts. "The valleys of the Yamuna, the Ganga and the Alaknanda witness heavy traffic of tourists. For this, the government has to construct new roads and widen the existing ones," says Maharaj Pandit, professor with the Department of Environmental Sciences in Delhi University. He says that a study should be conducted to assess the carrying capacity of the Himalaya and development should be planned accordingly. "A new (mountain) range like the Himalaya will remain steady if not tampered with much. But the huge expansion of roads and transport is bringing the mountains in Uttarakhand down," says Pandit. Road, he says, is a major destabilising factor for a mountain and it is a new phenomenon for the Himalaya. Pandit, who is in Uttarakhand for a research project, recounts an observation. "I was sitting at the Prayag bridge for tea and started counting the number of buses crossing it. Withing seven to eight minutes, 117 buses crossed," he says. Data with the Uttarakhand State Transport Department confirms this. In 2005-06, 83,000-odd vehicles were registered in the state. The figure rose to nearly 180,000 in 2012-13. Out of this, proportion of cars, jeeps and taxis, which are the most preferred means of transport for tourists landing in the state, increased the most. In 2005-06, 4,000 such vehicles were registered, which jumped to 40,000 in 2012-13. It is an established fact that there is a straight co-relation between tourism increase and higher incidence of landslides. The Ganga in the upper reaches has been an engineer’s playground. The Central Electricity Authority and the Uttarakhand power department have estimated the river’s hydroelectric potential at some 9,000 MW and have planned 70-odd projects on its tributaries. In building these projects the key tributaries would be modified—through diversion to tunnels or reservoirs—to such an extent that 80 per cent of the Bhagirathi and 65 per cent of the Alaknanda could be “affected”. As much as 90 per cent of the other smaller tributaries could be “affected” the same way. Pandit says that rampant construction, be it of roads, or dams, has led to land use change and the cumulative effect is getting reflected in the extent of damage rains have caused. “Our mountains were never so fragile. But these heavy machines plying everyday on the kutcha roads have weakened it, and now we suffer landslides more often,” says Harish Rawat, a BSc student in Uttarakhand’s Bhatwari region that suffered a major landslide in 2010. Rawat lost his home to the landslide when a major part of the main market and 28 shops were wiped out by the landslide. About 25 other houses were destroyed completely. Another local resident, Ram Prasad Tomar, a driver by profession in Uttarkashi town, says it is road cutting that has made the mountains so weak. He says the way mountains are cut to make roads has rendered the mountains unstable. “Road contractors, who come from outside, do not understand the mountains. Most of the expressways that are being constructed now are tangled in legal cases. After cutting of mountains, landslides continue for up to four years, and contractors go bankrupt clearing the debris,” he says. Environment engineer and Ganga crusader, G D Agarwal, says that construction along the Ganga has certainly cost a lot more if one includes the cost of damage to environment. People have completely destroyed the ecology of the mountains. “We see more landslides nowadays because of unplanned development in the hills,” he says. Experts say promotion of the state as a tourist destination is coming in way of sustainable development. I think govt. should control tourism in hill states. They should levy some sort of steep entry tax for vehicles coming from outside. Also they should run petrol vehicles only to control air pollution. There should be no registration of Diesel SUVs and steep entry tax for outside Diesel vehicles to cut pollution. Govt. should encourage traditional houses and discourage concrete houses in hills. I think this will somewhat releive hills. then it will effect the livelihood and income of the people. Well written article. With the mindless promotion of tourism and its ecological cost, may be its a disservice to visit these places at will. I partially agree and partially don't on this article. Expansion of hydel projects can be contributing to floods and disasters up to some extent. These should be constructed on benefit/risk analysis in hilly areas like Uttarakhand. But, one can't object to religious tourism in the name of floods and disasters. Instead, we need to focus on how to reduce if not avoid the impact of tourism religious or otherwise. Best thing to do is environmental friendly ways to achieve these. I am all for strictest environmental controls like Electric vehicles only, No Plastic and No use and throw items, proper diversions of streams in case of floods, No permanent structures on unstable areas, high levies and fees for all vehicles (private and public), No cutting of the hills for roads (instead workarounds) and other similar ideas. Relevant suggestions Rajiv. But the fact remains that a majority of the tourists here are coming from pilgrimages and raising barriers to entry for pilgrims will be met with vociferous opposition from religious fundamentalists. And that's where the crux of the problem lies. Combine that with the prospect of losing revenues from the tourism industry has probably made such measures of little interest to the government. Yes, unlike in the olden days, pilgrims are no longer interested in simple and sustainable travel. Everyone wants five-star accommodation, multi-cuisine restaurants and running hot water. Even after this disaster, many are blaming the governments for not making the proper 'vyavashthas' to facilitate their movements! State governments must undertake massive communication efforts to promote simple eco-friendly packages. Nature will take its toll over the years if we do not care for the environment. Thank You for the article and I do agree it is more man made disaster rather than Natural disaster. Keeping the ecology of the Himalayas and the fragile zones in the mountains, it is an obivious fact that it cannot take any more load on itself. Unless we are able to conserve our environment, the mighty Himalayas will not tolerate any human encroachment and will definitely one day gulp the nation. This is the Mahapralay which is written in the puranas. Hope people at least will below now hopefully. In india political parties have one point programme to achieve power by hook or crook political leaders have no concern about development or public problems. disaster in uttrakhand is worst example of blind leaders and dumb followers of our political system. If the Government is so keen on tourism, they should invest in it. - Allow only govt. approved light eco-friendly vehicles. All vehicles should be equipped with basic tools to aid them in case of any disaster. All drivers and their assistants should be trained in basic first aid and life saving techniques. - They should be connected via radio to the main head quarters and relay any information that might help contain a situation. - Regulate the number of vehicles entering/leaving the ghat roads. This number should assessed by careful study. - There should be regular checkpoints along the way to provide assistance if needed. - And last but not the least, educate the pilgrims. They should be made aware of the risk to life and property in undertaking such a journey and not treat it lightly. Mountains, like the rest of our environment have been made fragile by our actions. It is time we remedied it. Our constructions should be cohesive with the nature of the land we build in, not against it. Any project which affects our ecosystem adversely should be stopped. It can never help us in the long run. I want to let everybody understand that the calamity in Kedarnath valley both upper and lower was because of double standards set by Government both state and Central regarding development. Kedarnath valley is a very seismic zone..Rains are a .Regular thing...when I was there I always observed rains every second day or sometimes daily...my field work started in morning and I had to stop by 10 or 2 in afternoon....there was also a cloud burst and glacial lake outburst incident that happened some 30 years back that washed half of the valley then..some how local people again built there settlements in these areas..I myself was observing Disaster Management cell coming to Gaurikund the point from where 14 km onfoot trek started toward Kedarnath twice before yatra starts. Gaurikund is a very very narrow area that is not even bigger than a big football ground where heavy tourist influx happens...most of the times during May and June the area is jam packed...with jams of more than 10-20 km. adding to the misery of the area state government gave permission to Larsen and Turbo a private hydro power company to construct an underground tunnel for a dam in the upper Kedar valley. Dam under ground tunnel starts right from RAMBARA the first relaxing point or chattii to Kedarnath that everyday has lots of pressure of pilgrims and tourists from May to Oct. on the other hand forest department was never ready to broaden the roads because the area also falls on the fringes of Kedarnath WLS....a very important WLS with many threatened flora and fauna...including musk deer, snow leopard and many many more beautiful creatures. So, on one hand the rights of people have been snatched, rights have been freely granted to big contractors to peel the earth and have tunnel..!! results natural water resources dried up, no agriculture, drought sort situation, sometimes flood many landslides became a common practice. Even the students who did EIA (from Delhi University) for the project in 2007 suggested against the dam project. still a positive report was submitted to MoEF which was passed....as this year in 2013 70% of projects are passed without any hue and cry by Jayanti Natrajan our Honble minister of environment and forests. This was all sown by the politicians of the country and poors and many innocent pilgrims are finally harvesting...! Disaster management was never given a single consideration...it was all Bhagwan bharose yatra..and Govt. some 10 years back also introduced 4-5 helicopter companies in many areas for rich pilgrims...numbers of these companies might have also increased in all these years...! So, this wasn`t hampering this pristine environment nor was regular blasting dam activities..dumping of debris to initiate more of landslides...what was hampering the environment was subsistence survival activities of locals...be it removal of fodder, fuelwood, selling wild fruits...!! When are we going to wake up....how much more we want to see...! Stop the blame game. I request everyone to control climate change for the sake of the future generations.Its every ones responsibility to save all living beings. Well written article. Human greed and corruption are the basis for the poor construction of dams without anticipating the future calamities. Certainly the present calamity is mostly man made. The main important aspect is the need of Govt. 's control over different man made factors exploiting the NATURE. Considering the high seismic intensity and the aspects of Climate Change, there should be a mandatory EIA Studies by Sector Experts on all sorts of activities in the Himalayan Range and the they should be followed strictly without any compromise. Govt. may perhaps consider the establishment of an EIA Regulatory Authority to control over Developmental Activities, so that eco-friendly implementation can be ensured to protect the NATURE. 1. preponing office hours from 9am to 7 am and no ac to be used before say 11 am. It will have multiplying effects on all related functionaries like markets transport etc. 3. all such eco fragile pilgrimage/tourist sites should have green and clean development like green roads, green construction. 4. all non biodegradable wastes and accessory should not be allowed to be carried in such places. 5. for every person entering such places a tree should be planted from his pocket as green tree toll. 6. Most important not not in the hills but also in plains sign boards and kiosks should be placed educating every passerby about need to save green cover of earth and undue exploitation. 7. many a places govt and non govt buildings are illuminated in the evening to show the presence of deveploment and progress, which should be curtailed and allowed only on special ocassion Like 26th Jan/ 15th Aug/2nd OCt etc. A positive aspect is that mother nature has shown her might. This should be taken as a warning else more bigger disasters are in offing. The fight has to be undertaken by local people as they are doing it in Odisa against POSCO since last 8 years. And so far they have managed to keep govt. and MNC at bay through their dogged determination. 10. there is no pilgrimage but its only tourism with fun and enjoyment that make the things worsen over the time. Its easy to write suggestions but one who goes through it....knows the pain. I lost my maternal house in 2008 slide in this valley that was located near augustmuni. Since 2008, has been appealing to the govt. as to stop the ongoing hydel projects here and the unbriddled construction but nothing being listen. Money, pleasure and comfort has just dominated the society and their is no roadmap in practical except books and theories here.. Thank you a LOT!!! I wanted information to present in the class and this is...PERFECT!!! And your opinions and feelings boosted me up. So now I will definately win the debate! All the credit is yours. 1.sanctioning/installation of power projects without making survey and studying results of this type of construction. 2.construction of unplanned buildings,hotels,industries etc in hilly areas without thinking of global warming and other side effects on nature. 1.increase forest area or plantation of trees should be done. 2.dont construct new roads but only maintain previous roads. 3.not allow vehicle moving with other fuel accept cng to reduce pollution. 4.only sanction pollution free industries such as handloom,carpet making,furniture industry,agriculture industry,etc. 5.not encourage to much tourism. 7.not permit any new hotels for construction. 8.finally save forests,save glaciers,save himalayas and please save nature. 9.as no tourism industry required at cost of nature damage. 10.as nature is my mother as i am indian. Neglecting the desired priority of planning is a precursor to such incidents. Unless we delve with seriousness over the importance of 'planned, sustainable, participative' development, we land up trying to make all such cosmetic changes ex post facto every disaster. Are we responsible for the Uttarakhand disaster? World Bank report says global warming is making Indian Monsoon unpredictable. Because of this disaster more than 7000 people( kids,ladies,gents & seiner citizen ) were died.Thousends of people enjoured.thoused of animals are died & enjoured.thouseds of houses collapsed. According to media reports, when the floods struck, that time more than 20 lakh tourists are visiting the state that is huge number. When disaster happened that time we donÃ”Ã‡Ã–t have facility to control people, doctors to save injured people, donÃ”Ã‡Ã–t have trained people & transportation to rescues people. We need to grow more trees in the hills. We have to save the hills from environment contamination. Less no of transportation thoroughfare in the hill area to void pollution. We need to provide the infrastructure, roads, and building as per hill environment. We donÃ”Ã‡Ã–t build house near bank of rivers. .We must have good technique to get the weather forecast. Good medical facility must be available at these location. We need to establishment of disaster management group & follow there instructions. With the above precautions we can save thousands of lives. I think that such articles give lots of details about events. If they are read and taken in a good spirit we can save the happening of such disasters. The country is facing heavy monsoon rain fury in different regions.The Himalayan region is eco sensitive zone with mountains,glaciers,lakes with gigantic river system. 'Cloudburst' is a common phenomenon in most parts of Himalaya.This poses a great threat to environment & human settlements. Such frequent incidents can be managed by proper disaster management system,proper mateorological warning,efficient governance. 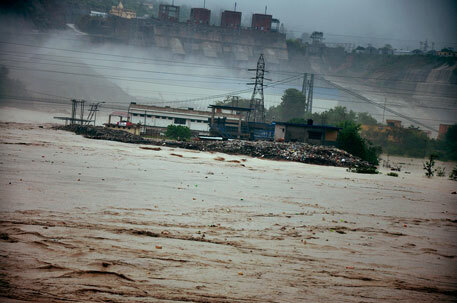 Irregular development of commercial buildings, clearence given to hydel power plants&various industries without proper assessment of environmental impact leads to the obstacle in the natural flowing path of various river systems and leads to the unexpected diaster. I think government should control hydel power construction. they have to limit these. use more solar and wind power in uttarakhand. Surprise to know that uttarakhand has 900 MW thermal power projects built without any public hearing done. They are located in uddamsingh nagar district. Even Mandakini river got divertered by hydro power projects companies. All these are going to be bomb shells on uttarakhand. please avoid these type of projects. well written acrticle...... loved it... helped with my project sooo much... THANK YOU SO MUCH!! Thus we can conclude that this disaster is a man made one, not a wrath of the nature type!!!! HATS OFF TO DOWN TO EARTH!! Excellent comment on disasters I appreciate the guy who has written this. Kedarnath disaster of 2013 is purely a man-made one, no doubt reg it. Reasons : (1) The sacred land of Kedarnath had started becoming a tourist pleasure spot for cheap enjoyments and merry-making. (2) It had become a land of commerce and financial enterprise. (3) Massive constructions of dams and the resulting crowd in terms of labour work, engineering activities at the construction sites are not at all conducvne to the fragile zone of the Himalayas..(4)Traffic on the kedarnath route was amazingly high which clearly forecast the disaster. (5) It is the land of Lord Shiva and instead of maintaining its serenity and sacredness pop music was in display all over the place, enjoyment of wine, intoxicants .... were rampant in the area disturbing Nature's harmony to the greatest extent which invited the peril. (6) The route was narrow, the horses travelling on the route were enormously large in number almost obstructing the way of the pedestrians and even causing physical and mental damages. The horsemen were the worst. The whole environment were filled with smokes of BIDIS used by the horsemen all along the way. (7) And look at the poor porters carrying men of heavy-weights on their back for the sake of earning daily wage to meet their needs of the stomach. Nobody paid any heed to their plight ! People who are not capable of travelling on foot do not deserve to be carried by porters giving the latter so much pain physically and mentally. This is not the way of God. Nature had taken her due course of action in time, it is well and good. Let people realise their own faults and do penance. Or welcome more disasters of the kind which is MAN-MADE not Natural Calamity. In fact the two lakes above Kedarnath had never exploded, they remained in tact as before.